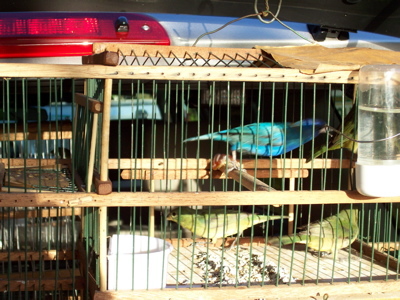 The incidence of illegal trapping and subsequent selling of migratory birds in South Florida is rampant. The two main targeted species are Indigo Buntings (Passerina cyanea) and Painted Buntings (Passerina ciris). However, other more common migratory birds have also been trapped, including cardinals, orioles and others. The Migratory Bird Treaty Act prohibits, among other things, possessing or killing any migratory bird. The Florida Fish and Wildlife Conservation Commission (FWC), together with the US Fish and Wildlife Service (USFWS) regularly finds and appropriately cites those who choose to engage in this trade. These agencies need your help to preserve these national treasures. Past cases have shown a number of common traits. Combining what is known about the subjects with what is known about the migratory habits of the species in question will enable these agencies to effectively combat this problem. A few years ago the FWC and USFWS broke up a large ring of trappers and dealers, leading to multiple arrests and thousands in penalties. All current data suggests the trappers are back. The goal of this enforcement effort is to break up these rings and release the captive birds into their natural habitats to proliferate and continue the species. To view a video of a release event in April 2018, click here. For more details on each of the illegal bird trapping cases from a Justice Department press release, click here. Fish and Wildlife Conservation Commision officers are faced with an enormous problem, as they are notoriously understaffed. Additionally, possessing a protected bird is a misdemeanor and a sworn law enforcement officer, by law, must witness the possession. Roughly translated, officers cannot arrest a subject based solely upon what a citizen saw. Because trappers can earn large amounts of cash for only a few hours work, the trapper will likely return, especially if he or she was successful in a particular area. In short, if while enjoying your passion for bird watching you find a large congregation of buntings or other colorful birds, contact the FWC (see below) so they can return later and thoroughly search the area, then include this location on their “Areas to Watch” list. If you happen to find a trap in the woods or brush, please call immediately and an officer will respond to begin surveillance. A word of caution: The trappers know that what they are doing is wrong, so they are very suspicious by nature. Hanging around the trap or making it obvious that you know the trap is present may scare the individual away and law enforcement may “lose” this area for awhile. If you are able to see an individual with a trap in hand and you see his or her vehicle, attempt to get a license plate number and description of the individual. Most birders carry binoculars and/or cameras, some of you carry very nice cameras and getting a good photo from a long way off is not impossible. Remember, your safety is more important than any bird so absolutely do not confront the subject. The photo at the top of this page shows a good example of a trap. In the past, enforcement agencies have found some common traits that they use to find the traps. These tips are only guidelines and not set in stone. The traps are usually placed 2-5 feet off of the ground. They don't use ladders and birds roost off of the ground to avoid predators. The birds seek safety in brushy corridors. Law enforcement has found that corridors with a north-south orientation have more success than east-west. Buntings are attracted to Lantana and the trappers know this, so be especially vigilant around brushy corridors containing Lantana. For those that are not familiar with Lantana, you can search Lantana on your favorite search engine or at your local library. In addition, the trappers rarely leave their traps unattended. If you happen to spot a trap or traps, remember that the trapper is more than likely close by. Keep your safety in mind and do not confront the subject. Remember the location; i.e. street and avenue and make the call. Additionally, most of the traps will have a bait bird in it to attract another bird. Females attract males and other females and males attract females. The traps are usually homemade and appear extremely time-consuming to construct, which also supports the likelihood of trappers not leaving their traps unattended. Lastly, don't hesitate to call, don't feel silly if you call law enforcement for what turns out to be a false alarm. Remember, this is law enforcement's job and they all have a passion to protect wildlife. To report illegal bird trapping, call the FWC at 888-404-FWCC (3922).